To use the Custom Vision Service for image classification, you must first build a classifier model. In this guide, you'll learn how to build a classifier through the Custom Vision website. A set of images with which to train your classifier. See below for tips on choosing images. 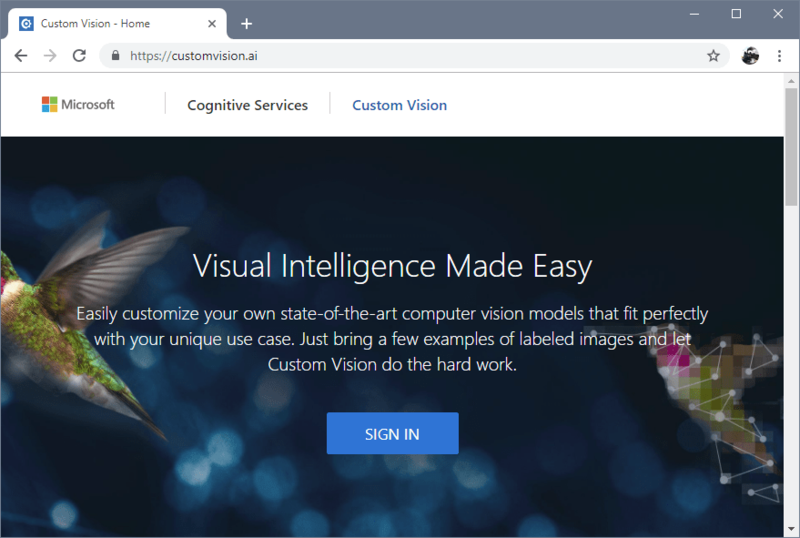 To use Custom Vision Service, you will need to create Custom Vision Training and Prediction resources in the in the Azure portal. This will create both a Training and Prediction resource. In your web browser, navigate to the Custom Vision web page and select Sign in. Sign in with the same account you used to sign into the Azure portal. To create your first project, select New Project. The Create new project dialog box will appear. Enter a name and a description for the project. Then select a Resource Group. If your signed-in account is associated with an Azure account, the Resource Group dropdown will display all of your Azure Resource Groups that include a Custom Vision Service Resource. If no resource group is available, please confirm that you have logged into customvision.ai with the same account as you used to log into the Azure portal. Also, please confirm you have selected the same “Directory” in the Custom Vision portal as the directory in the Azure portal where your Custom Vision resources are located. In both sites, you may select your directory from the drop down account menu at the top right corner of the screen. Select Classification under Project Types. Then, under Classification Types, choose either Multilabel or Multiclass, depending on your use case. 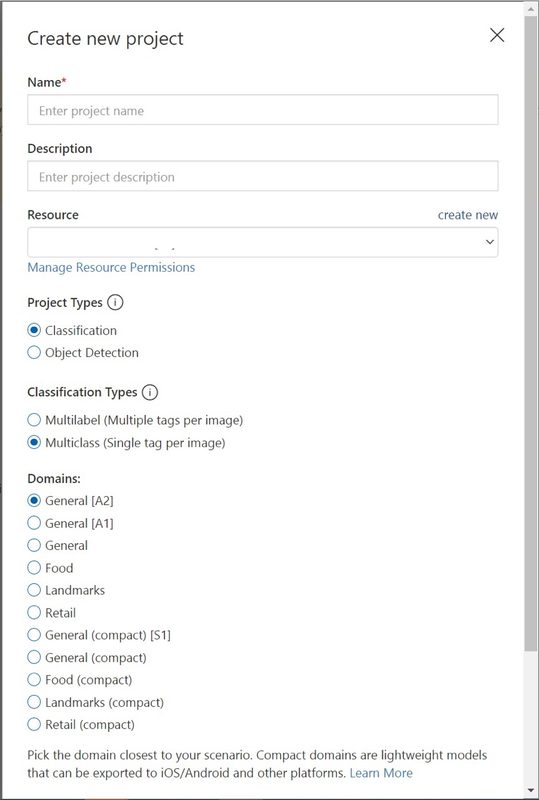 Multilabel classification applies any number of your tags to an image (zero or more), while multiclass classification sorts images into single categories (every image you submit will be sorted into the most likely tag). You will be able to change the classification type later if you wish. Next, select one of the available domains. Each domain optimizes the classifier for specific types of images, as described in the following table. You will be able to change the domain later if you wish. Generic Optimized for a broad range of image classification tasks. If none of the other domains are appropriate, or you are unsure of which domain to choose, select the Generic domain. Food Optimized for photographs of dishes as you would see them on a restaurant menu. If you want to classify photographs of individual fruits or vegetables, use the Food domain. Landmarks Optimized for recognizable landmarks, both natural and artificial. This domain works best when the landmark is clearly visible in the photograph. This domain works even if the landmark is slightly obstructed by people in front of it. Retail Optimized for images that are found in a shopping catalog or shopping website. If you want high precision classifying between dresses, pants, and shirts, use this domain. Compact domains Optimized for the constraints of real-time classification on mobile devices. The models generated by compact domains can be exported to run locally. As a minimum, we recommend you use at least 30 images per tag in the initial training set. You'll also want to collect a few extra images to test your model once it is trained. In this section you will upload and manually tag images to help train the classifier. To add images, click the Add images button and then select Browse local files. Select Open to move to tagging. 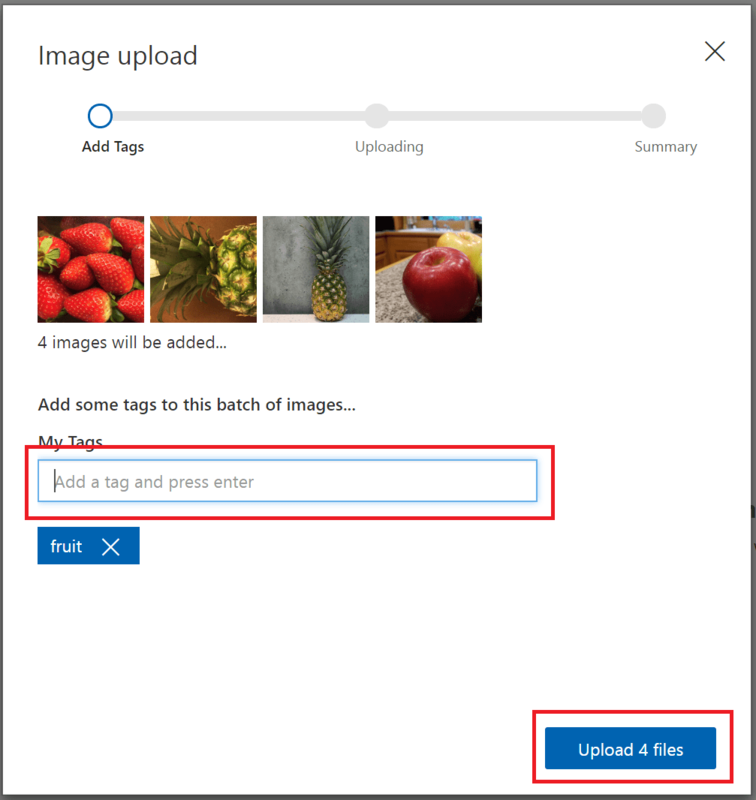 Your tag selection will be applied to the entire group of images you've selected to upload, so it is easier to upload images in separate groups according to their desired tags. You can also change the tags for individual images after they have been uploaded. To create a tag, enter text in the My Tags field and press Enter. If the tag already exists, it will appear in a dropdown menu. In a multilabel project, you can add more than one tag to your images, but in a multiclass project you can add only one. 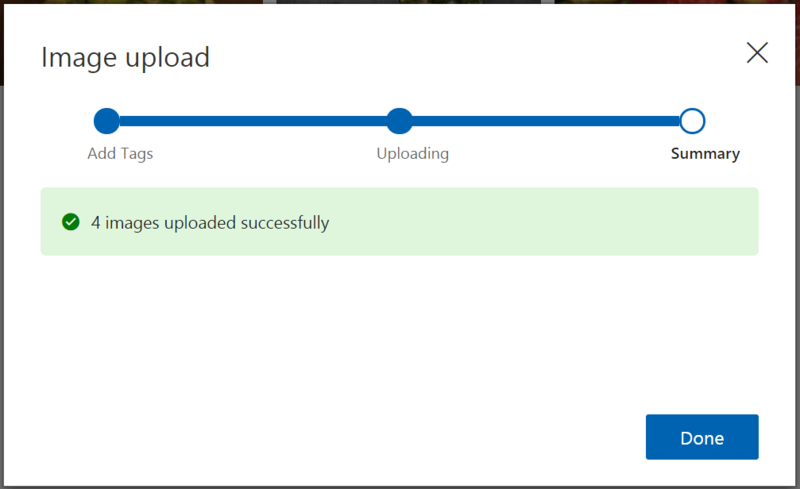 To finish uploading the images, use the Upload [number] files button. Select Done once the images have been uploaded. To upload another set of images, return to the top of this section and repeat the steps. To train the classifier, select the Train button. The classifier uses all of the current images to create a model that identifies the visual qualities of each tag. The training process should only take a few minutes. During this time, information about the training process is displayed in the Performance tab. Precision indicates the fraction of identified classifications that were correct. For example, if the model identified 100 images as dogs, and 99 of them were actually of dogs, then the precision would be 99%. Recall indicates the fraction of actual classifications that were correctly identified. For example, if there were actually 100 images of apples, and the model identified 80 as apples, the recall would be 80%. Note the Probability Threshold slider on the left pane of the Performance tab. This is the threshold for a predicted probability to be considered correct when computing precision and recall. Interpreting prediction calls with a high probability threshold tends to return results with high precision at the expense of recall (the found classifications are correct, but many were not found); a low probability threshold does the opposite (most of the actual classifications were found, but there are false positives within that set). With this in mind, you should set the probability threshold according to the specific needs of your project. Later, on the client side, you should use the same probability threshold value as a filter when receiving prediction results from the model. 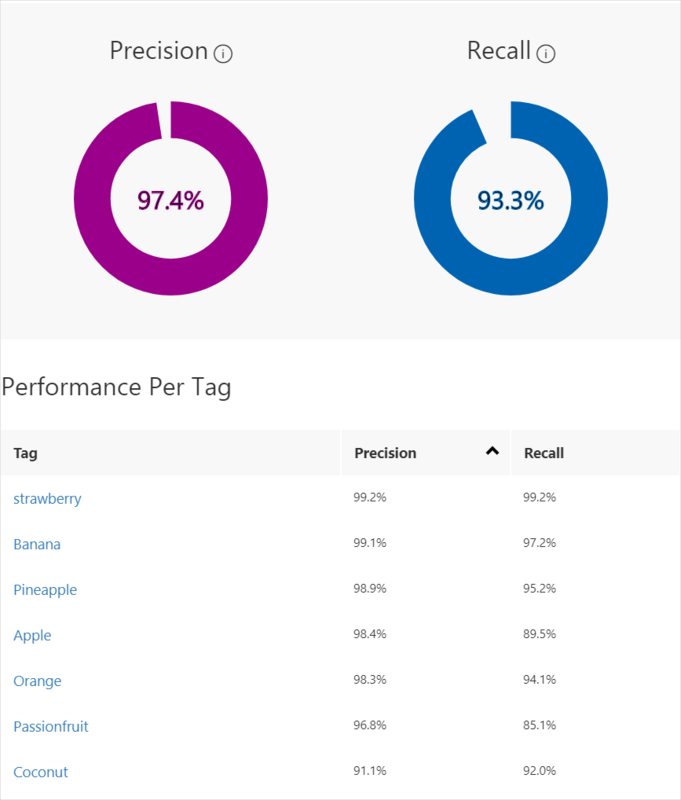 Each time you train your classifier, you create a new iteration with its own updated performance metrics. You can view all of your iterations in the left pane of the Performance tab. In the left pane you will also find the Delete button, which you can use to delete an iteration if it's obsolete. When you delete an iteration, you delete any images that are uniquely associated with it. In this guide, you learned how to create and train an image classification model using the Custom Vision website. Next, get more information on the iterative process of improving your model.